Mauna Lani Bay Hotel & Bungalows is located on the sunny Kohala Coast on the Big Island of Hawaii. Nestled oceanfront on a sandy beach you’ll discover a myriad of activities to enjoy or you can relax and do nothing at all. On the beach you’ll find swaying hammocks and private cabanas. 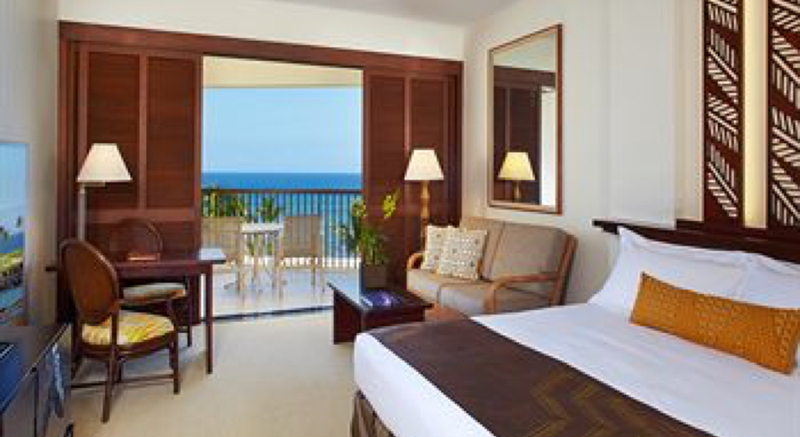 Each Bungalow bedroom has a four post bed that heightens the atmosphere of sophisticated island living. The headboards showcase a custom carving of the Hawaiian flower that each Bungalow is named after. The two master baths each include a private tropical garden with a rain shower, and a stand-alone tub. Recent enhancements include a state-of-the-art entertainment system & 65″ LED HD television. Mauna Lani Sea Adventures offers catamaran sails, sunset cruises, seasonal whale-watching sails, diving lessons, open water diving and night dives. The Kohala Coast offers some of the most beautiful and exciting diving in the world. Licensed instructors know the best locations and will personalize an excursion for you. Resort Diving Certification is available at the hotel pool. Cruise down the coastline on the Winona, a 50-foot catamaran, and enjoy snorkeling in a secluded cove, watch the sunset or view amazing humpback whales. Whales are normally in Hawaiian waters from November though March. Call the Concierge at 808-881-7911 or visit Mauna Lani Sea Adventures. At the beach visit the Hulakai Crew and get ready for a day of adventure on the water. Learn how to Stand up paddle (SUP), paddle a canoe or take on the waves with a surfing lesson. Whether you’re a novice or a pro you’re sure to have an amazing experience. Mauna Lani Sports Club features state-of-the-art equipment, a wide array of fitness classes, a lap pool and a professional, friendly team to assist you with your fitness goals. Mauna Lani Tennis Club offers plexipave courts-three are lit for night play. The open air signature stadium court features spectator seating for 500. If you’re a pro or a beginner – the Mauna Tennis Club will find you a match. Mauna Lani Bay Hotel & Bungalows is a Big Island family resort home to its very own Camp Mauna Lani. Camp Mauna Lani is an exciting adventure for youngsters ages 5 years to 12 years. Each day of camp is a unique opportunity for children to discover the wonders of Hawaii and learn more about the culture of the Islands. Activities vary daily so there is always something new to discover. Excursions include exploring tidal pools, historic fishponds and petroglyphs, playing Hawaiian games and Hawaiian crafts. *Camp Mauna Lani is open year-round and makes Mauna Lani Bay the ideal destination for family vacations. From intimate Kohala sunsets to hammocks swaying in a sea-kissed ocean breeze, Mauna Lani provides the perfect backdrop for your celebration of love. Let us handle all the details of a perfect Big Island wedding or anniversary, rich in Hawaiian elegance and sparkling with the magic of tropical bliss. Mauna Lani adds a memorable touch to everything from a romantic Hawaiian beach wedding to a gala affair under the stars. Our Weddings experts work with couples on the myriad of details that make up the big day. They see to it that flowers, wedding cake, music, dining, and photography are all designed to the bride and groom’s specifications. They personally work with couples to ensure their special day is truly magical.